Can You Trust Your Models? Jennifer Herron, CEO of Action Engineering, interviewed Raphael Nascimento, CADIQ Product Manager at International TechneGroup Inc. (ITI), for this featured blog about 3D enterprise accountability. Action Engineering appreciates ITI’s generous support as a Signature Sponsor of the 2018 3D Collaboration & Interoperability Congress in Golden, Colorado on October 15-18, 2018. Jennifer Herron: This year’s 3D CIC theme is Enterprise Accountability for model-based enterprises. Accountability can be driven through both automated (software) means and human processes. However, many companies lack compliance to many processes. This year’s 3D CIC theme focuses on how compliance to 3D model-based procedures and practices enable 3D collaboration and interoperability. How do ITI’s products drive accountability of complex 3D data through automated processes? Raphael Nascimento: As experts in product data interoperability, ITI offers solutions in the areas of conversion, integration, validation, and migration. CADIQ, ITI’s solution for CAD model validation, is perhaps the most relevant product for this year’s theme of Enterprise Accountability. Becoming a model-based enterprise promises significant value, mainly resulting from the automation of the design, manufacturing, and inspection processes. However, this value will only be realized if the CAD data upon which these automated processes rely is of high quality. CADIQ identifies model-based design (MBD) data quality issues that impact downstream reuse for manufacturing, simulation, data exchange, and collaboration. But as important as CAD data quality is, the checking and validation of the CAD data cannot become a bottleneck within the overall product development process, or companies risk forfeiting some of the benefits of automation. CADIQ can be seamlessly integrated into PLM systems so that validating the quality of a model, or its derivatives, can be automated and included as part of the promotion or release workflows. As long as there are no issues identified with the data, the design, manufacturing, and inspection processes can thus proceed unimpeded. If some issues are identified, the workflow can automatically notify the appropriate user to resolve them before continuing. Jennifer Herron: How do ITI’s products enable accountability through human processes? Raphael Nascimento: While automation can offer substantial benefits, it can never completely replace human processes. There are two examples where human interaction is an important part of the process. The first example is when the CADIQ validation finds some issues with the quality of a CAD model or its derivatives. When this happens, a human with knowledge of the production process or the engineering intent should be involved in dispositioning each issue as being either significant enough that it requires some corrective action, or negligible enough that it can safely be ignored. Software tools and automated workflows need to accommodate this human-driven dispositioning activity. The second example is when comparing different revisions of a 3D model. In this case, it is expected that CADIQ would identify some changes between the two models, but the goal of such a comparison is to identify the unintended changes. This process requires knowledge of the intended changes between the two models so that the reviewer can classify the identified changes as being either intended or unintended. CADIQ can ensure proper documentation of intentional changes is present for downstream consumers. In summary, a well-designed process should automate those tasks that can be automated and should also provide the tools to streamline those tasks requiring human interaction. CADIQ supports MBE-related processes in both areas. Jennifer Herron: Do humans understand the need for Verification and Validation due to the volume of 3D data we are now producing with modern CAD systems? Is the volume of data driving the need for automation? Validation. The assurance that a product, service, or system meets the needs of the customer and other identified stakeholders. Verification. The evaluation of whether or not a product, service, or system complies with a regulation, requirement, specification, or imposed condition. Raphael Nascimento: I believe that people understand the importance of Verification and Validation. Confirming that product data complies with standards is just as important now, as the volume of 3D data has increased, as it was years ago when product development was primarily 2D. What’s different today are the tools that people use to help them do these tasks. In the past, we had people (drawing checkers) who performed these tasks manually for 2D drawings. Today, we have software tools that can check the quality of a 3D model or that can compare a 3D derivative model against its source model in the native CAD format. So, the need for Verification and Validation hasn’t really changed, but the tools available to perform that function have changed. CADIQ identifies a missing annotation in a side-by-side comparison of native and derivative CAD models. The need for automation is ultimately driven by the business value that can be achieved because of the automation. Validation can be performed manually, but that manual process would take longer and potentially be more error-prone than using software tools. Validation software presents the opportunity to derive significant benefits, such as reduced time and reduced errors, through automation. Since the validation process is performed per model (or data set), as the number of models (or data sets) increases the benefits from automation are amplified, which drives the need for automation. Jennifer Herron: What value can be achieved by an enterprise when using ITI’s products for accountability solutions? Raphael Nascimento: CADIQ, which identifies quality issues with 3D models and their derivatives and documents the changes between revisions of a model, provides value in several ways. First, there is the avoidance of costs associated with the scrap and rework resulting from poor quality models that make their way downstream. By identifying model quality issues early, these costs can be avoided. Second, there is the time savings due to automation. As I mentioned before, validation can be done manually, but significant time savings can be achieved by automating the validation process. Third, there is the somewhat intangible benefit of establishing trust in a model or its derivatives. The results of a CADIQ analysis can act as a certificate of quality for a model and its derivatives. 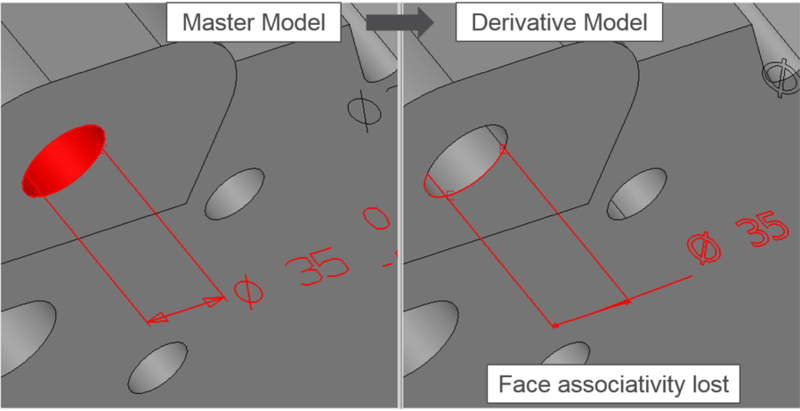 Just knowing that a model meets a certain level of quality, or that a derivative model matches the design model in the native CAD system, allows the downstream functions to use those models with confidence. While it might not be easy to pin a dollar value on a trusted model, it is very important nonetheless. CADIQ offers confidence in derivative CAD models and produces 3D PDF reports to document quality. Jennifer Herron: How has the demand for ITI’s products’ accountability functionality evolved as industries’ 3D model-based processes have matured? Raphael Nascimento: CADIQ has been around for a long time and has enjoyed success in industries where the quality of 3D models was of critical importance, even though we wouldn’t call their processes “MBD” by today’s definition. However, in recent years as 3D model-based processes have become more common and the overall industry landscape has matured, we’ve seen a growth in demand for a validation solution. As we’re able to grow, we can reinvest that growth back into the product. We have an exciting roadmap for the product that enhances its industry-leading technical capabilities, improves its usability, and integrates more closely with automated PLM-driven processes. Raphael Nascimento: CADIQ focuses on ensuring the quality of a source model and its derivatives during the design phase of the product development cycle. Before passing their models along to downstream manufacturing and inspection, authors can validate that their models satisfy standards of geometric integrity and manufacturability. 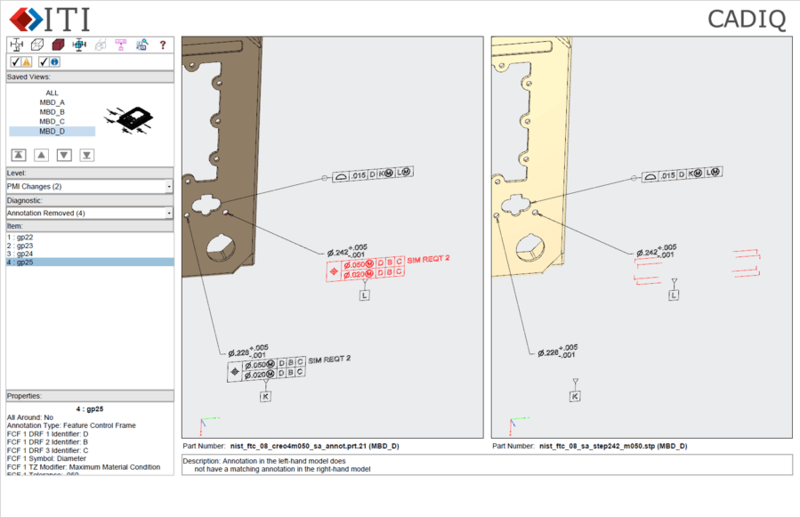 MBD models can be checked to ensure that the annotations, attributes, and presentation states all adhere to industry or company standards. Derivative models, such as STEP, JT, 3D PDF, and others can be validated to ensure that they match their source models in the native formats. Derivative validation includes both the geometry, as well as the MBD data – like annotations, attributes, and presentation states. CADIQ identifies a PMI translation difference in a derivative CAD model. 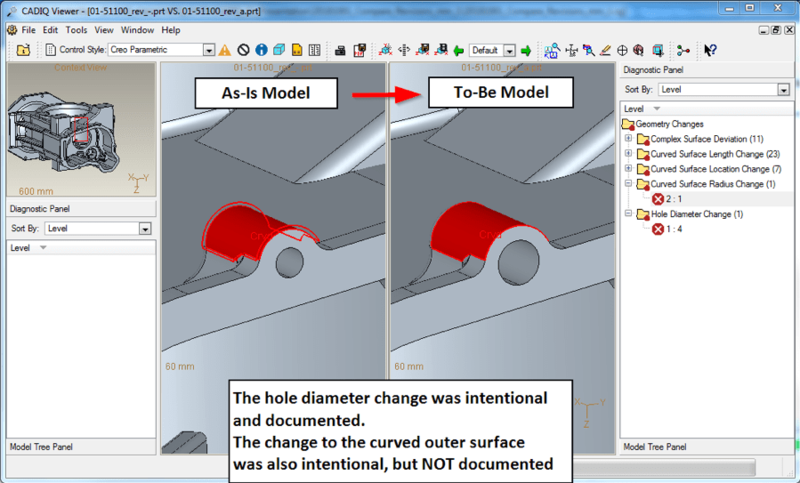 Providing authors of CAD data with the tools to identify potential problems with their models improves accountability because these individuals are now able to be responsible for the quality of the data they produce. To put it another way, without such tools it was common for models with problems to be passed downstream because nobody was aware that the problems existed. 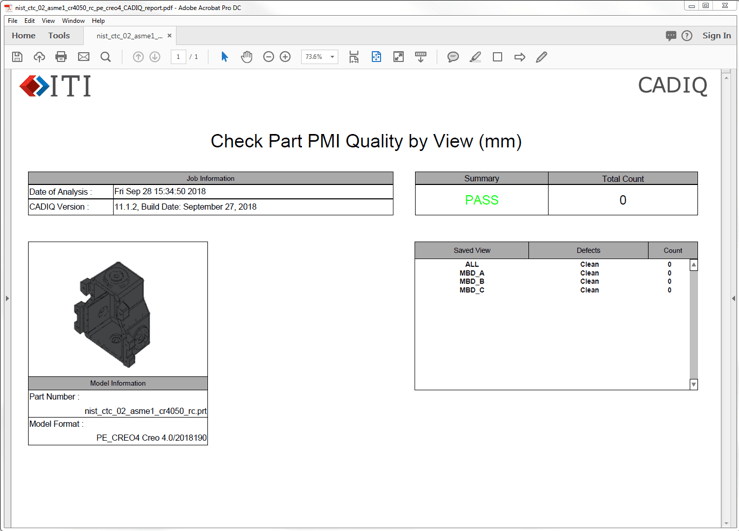 Downstream consumers of CAD data are also more accountable because they can insist upon seeing a “Certificate of Model Quality” before doing any significant work with the model in their manufacturing or inspection systems. Jennifer Herron: What excites ITI the most about 3D CIC 2018? Raphael Nascimento: On a personal level, what’s most exciting to me about 3D CIC 2018 is having the opportunity to spend a few days hanging out with a bunch of people who share a high level of enthusiasm about the topic of MBD/MBE. There’s always something that I can learn, whether it comes from attending a presentation or from a casual conversation during a break. As a product manager working for a company that provides software solutions in the MBD/MBE space, I’m also excited by the opportunity to learn more about what companies need from their software tools to help them succeed in their MBD/MBE journey. The 3D CIC event is a great opportunity to catch up with a number of existing customers and prospects who are all gathered in one place. Raphael Nascimento is currently a Product Manager at ITI where he is responsible for product strategy, planning, and execution for ITI’s CAD validation product, CADIQ. 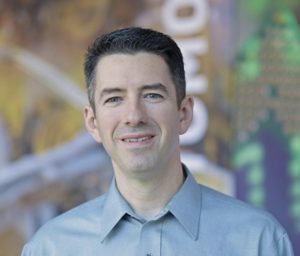 Prior to joining ITI, Raphael spent over 20 years at PTC where he held several roles, most recently as Product Manager for several functional areas of Creo Parametric, including: MBD, 2D Detailing, GD&T Advisor, and Tolerance Analysis. He also worked as a Consultant and Trainer in PTC’s Global Services where led clients in the implementation of new technology and new business processes, including MBD/MBE. Raphael is an active participant at ASME Y14 Committee meetings and is a member of the Y14.41 and Y14.41.1 subcommittees. Raphael attended Rensselaer Polytechnic Institute where he earned a bachelor’s degree in mechanical engineering. To remain competitive, manufacturers are implementing MBE, advanced simulation, and PLM initiatives supported by best-in-class engineering systems. When product data interoperability issues threaten to impede the progress of these initiatives, you need a partner with proven experience. ITI has product data interoperability experts specializing in conversion, integration, validation and migration solutions. Their customers recognize the value in having a trusted solution partner that provides more than just software. ITI solves complex product data interoperability problems so that the world’s leading manufacturers can focus on making great products. You need to keep your initiatives moving forward. Let ITI help create momentum. Action Engineering thanks International TechneGroup Inc. for their Signature Sponsorship of 3D CIC 2018 taking place in Golden, Colorado on October 15-18, 2018. Click here to find out more about the event and to register.